Keeping your college dorm desk organized and looking great is just as important as making the rest of your college dorm room look great. You need the space on your dorm desk to work on your homework and you don't want to have to move things around every time you need to set up your tablet or college textbook. Keeping that space on your dorm desk looking great involves dorm organization dorm essentials. Our Super Stacked Dorm Desk Bundle in Aqua will provide you with all the dorm necessities you need to keep your college dorm desk organized and even add to your dorm room decor while hanging out on your dorm desk. 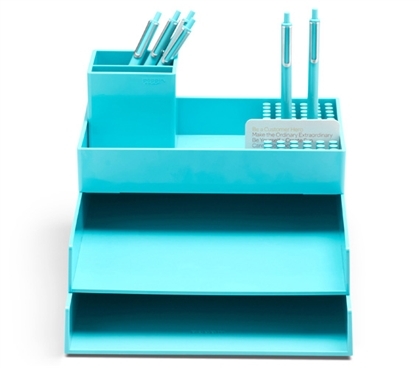 Our Super Stacked Dorm Desk Bundle in Aqua will allow you to spread the dorm organizers in different areas around your dorm desk or for ultimate, compact organization you can stack these dorm essentials so you take up less space on your dorm desk. And as you know, dorm supplies that take up more vertical space than desk space will allow you extra room to spread out and set up your college textbooks. Since you're in college, you're going to be spending a lot of time at your dorm desk. Having bland dorm organizers on your dorm desk won't make working there any easier. In fact, it will make it a little worse and you may find yourself going to coffee shops often to avoid your dorm room. You don't want to do that, so instead brighten up your area and work more effectively with our Super Stacked Dorm Desk Bundle in Aqua. -Ballpoint Pens (Set of 12): Don't be the person that asks everyone around you including the professor if they have an extra pen you could borrow so you can take notes. These dorm essentials will make sure you aren't that person and you'll be so well stocked on this basic college supplies item that you can keep a few in your college backpack and a few in your pen cup. -Pen Cup: You're going to need a home for all those pens! This dorm organizer has a divider so your pens and highlighters play nicely and are separated so you can grab exactly what you need without trying three times to grab the pen you are looking for. -Soft Grip Grass: Let's be honest - you're going to need and have a lot of pens. You're going to be taking a lot of notes. With all those pens in your college supplies, you're going to need somewhere to keep them other than just your pen cup. This dorm essentials item holds a pen, pencil, or even post card in between its blades of grip grass - plus it's just a fun dorm item! -Medium Accessory Tray: This handy dorm necessities item can keep your pen cup and grip grass in one conveniently stacked location and even store your entire collection of sticky notes in the tray! -(2) Letter Trays: Your homework is too important to have lying around in random stacks on your dorm desk. This set of letter trays will help prevent that and keep those important papers organized. You can even create an in and out box for homework to turn in and homework to work on. Each tray holds up to 300 sheets, but don't worry, we don't think you'll have that much homework. At least....we hope.